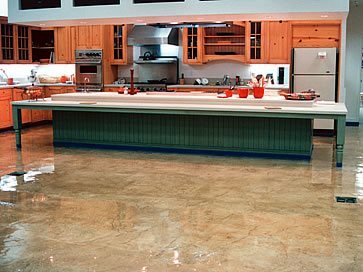 Selecting the right finish for your concrete floor is important. Enriching the color intensity of the concrete, whether the color is integral, a stain or dye, or obtained from a dry-shake hardener and antiquing release. Adding sheen to the surface ranging from satin to high gloss. 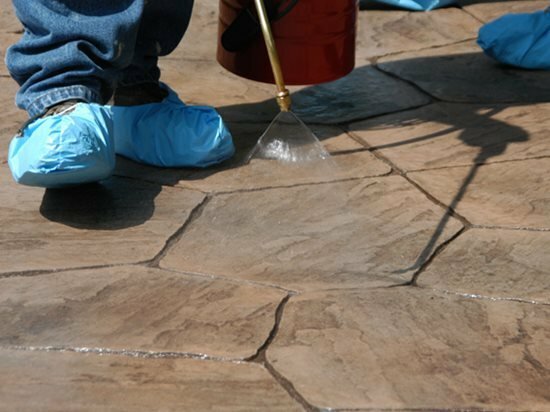 Blocking the penetration of dirt, oil, grease, chemicals, and stains, making the concrete easier to clean and maintain. Inhibiting dusting of the surface. Preventing the intrusion of water and chlorides, which minimizes freeze-thaw damage. Protecting against abrasion and wear. To obtain all these great perks, however, you must choose the right sealer for the job at hand. You'll find hundreds of products on the market to suit just about every type of concrete application, but no one sealer is perfect for all projects. Even worse, using the wrong sealer or applying it improperly can ruin an otherwise flawless decorative concrete installation. To help you sort through the options and avoid making mistakes you'll regret later, here's an overview of the basic types of sealers available, followed by a list of questions to ask when shopping around for the best product for your needs. How Much Concrete Sealer Do I Need? Money-saving tip: If the sealer is available in 5-gallon pails, it might be cheaper in this case to purchase the 5-gallon container rather than four 1-gallon units (often larger containers are more economical). And it won't hurt to have some extra on hand in case you run into problems. Is the Sealer Compatible with the Decorative Surface Treatment You're Applying? Always check with the sealer manufacturer to verify the compatibility of its product with the decorative surface you plan to put it on. Some sealers may interact with certain overlays or coloring agents, resulting in unwanted side effects such as blistering, bubbling, or bleeding of color, according to Bob Harris, president of the Decorative Concrete Institute and author of a collection of training guides on decorative concrete. If you plan to apply sealer to an overlay or topping, Harris recommends checking with the overlay manufacturer for recommendations as to the appropriate sealer to use. Or better yet, take the "systems approach" and select the sealer the overlay manufacturer sells specifically for use with its products. Does the VOC Content of the Sealer Meet Current Federal and Local Regulations? If you plan to use a solvent-based sealer, be sure to check the volatile organic compound, or VOC, content of the product to make sure it doesn't exceed acceptable levels in your area. The federal government as well as state and local agencies have mandated certain maximum allowable levels of volatile VOCs that concrete sealers are permitted to contain. Certain states default to the federal mandates while some set their own. At the local level, some counties and air-management districts set their own maximum VOC levels. Not all solvent-based sealers contain the same amount of VOCs, points out Chris Sullivan, Vice President of Sales and Marketing for ChemSystems Inc., and author of the popular technical blog, Sullivan's Corner. For example, xylene is a common solvent found in concrete sealers and produces VOCs, while acetone, another common solvent found in concrete sealers, is considered an exempt solvent and produces no VOCs. The other key factor, notes Sullivan, is the solids content. The higher the solids content, the lower the liquid solvent and VOC content. You can find out the solids and VOC content for a sealer by looking at the Material Safety Data Sheet (MSDS) or specification sheet for the product. To keep maintenance to a minimum, it's important to select a sealer that will protect your concrete or decorative overlay from the traffic conditions and elements to which it will be exposed. For example, for a stamped concrete driveway, you'll need a sealer that repels oil and grease stains, prevents penetration of water and deicing chemicals, and resists abrasion. The primary type of sealer used for exterior concrete flatwork is a solvent- or water-based acrylic. If you don't want a sheen on the surface and prefer a natural look, a penetrating sealer is an alternative that provides excellent protection against outdoor exposure conditions. For a decorative interior floor, a high-build sealer with good resistance to scuffs and staining, such as a polyurethane or epoxy, will generally provide the best protection and be easier to maintain. On indoor surfaces, softer acrylic sealers usually require regular maintenance with several coats of a sacrificial floor finish, or wax, to prevent wear and black heel marks. One of the reasons acrylic sealers are commonly used for exterior applications is because they are "breathable" - they provide good water repellence while allowing moisture vapor within the slab to escape. Most penetrating sealers are also breathable. Epoxies offer excellent water repellence, but some products are impermeable and can end up trapping moisture in the concrete. If you suspect that excess moisture is present in the slab, whether indoors or out, make sure the sealer you use is permeable and won't restrict the ability of the concrete to release moisture vapor as needed. Read this article by Robert Cain for more information on controlling moisture-vapor transmission. How Long Will the Concrete Sealer Take to Dry? How soon a sealer can be recoated or opened to traffic may be critical on fast-track projects. Acrylic sealers dry the fastest, setting to the touch within 30 to 60 minutes after application and ready for light traffic as soon as 12 hours after the final coat, depending on air temperature, humidity levels, and other environmental conditions. Polyurethanes and epoxies typically require longer curing times of at least 24 hours. Is the Product Safe to Apply Indoors? When working indoors, it's usually safer to use a water-based rather than solvent-based product, especially if the area can't be ventilated. Solvent-based sealers are extremely flammable and the fumes they emit can be hazardous to breathe. What Type of Finish and Surface Appearance Do You Want to Achieve? If you're after a wet look to enhance the appearance of colored finishes, choose a sealer with a medium- to high-gloss sheen. Most acrylic sealers are available in a range of sheen levels. Solvent-based acrylics generally enhance color better than water-based products. For an additional color boost, you can even create color washes with some acrylic sealers by mixing in powdered or liquid tints. For applications where a shiny or wet look is not desirable, you can also find film-forming sealers with matte or low-gloss finishes. There are even "flattening agents" available that can be mixed into some sealers to control the level of gloss. Another option is to use a penetrating sealer that won't leave a surface film. In high-traffic areas, the slip resistance of a sealer may also be important. For these surfaces, look for a sealer that exceeds ASTM D2047 slip-resistance requirements. What Is the Life Expectancy of the Sealer, and Does the Manufacturer Provide a Warranty? The life expectancy of a sealer depends, in part, on exposure conditions and how well the sealer is maintained. In general, however, epoxies and urethanes deliver the best long-term performance and can last years before the need for reapplication. Some manufacturers may even provide a warranty to back the performance claims for their products. However, this warranty will be null and void if you don't adhere to the manufacturer's guidelines when applying the sealer. Notice that cost is not one of the key considerations listed here. Certainly, you should compare prices of similar products to get the best value, but don't try to pinch pennies. Sealer is too important to the overall appearance and longevity of your work. Plus, you don't want to give your clients a protective finish that will wear away after only a year or so. "When it comes to sealers, you really do get what you pay for. Save now, pay later is often the result of going cheap," says Sullivan.